The purpose of this example is to show the features of multiscale principal components analysis (PCA) provided in the Wavelet Toolbox™. The aim of multiscale PCA is to reconstruct a simplified multivariate signal, starting from a multivariate signal and using a simple representation at each resolution level. Multiscale principal components analysis generalizes the PCA of a multivariate signal represented as a matrix by simultaneously performing a PCA on the matrices of details of different levels. A PCA is also performed on the coarser approximation coefficients matrix in the wavelet domain as well as on the final reconstructed matrix. By selecting the numbers of retained principal components, interesting simplified signals can be reconstructed. 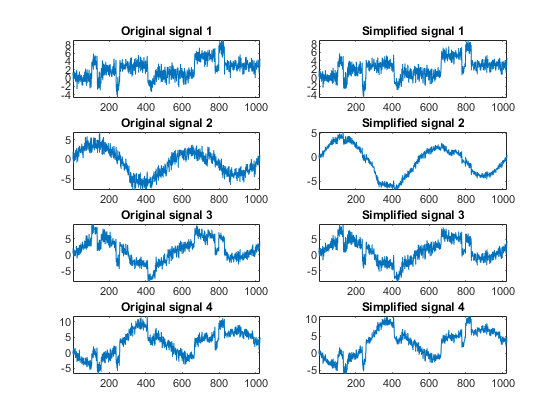 This example uses a number of noisy test signals and performs the following steps. Multiscale PCA combines noncentered PCA on approximations and details in the wavelet domain and a final PCA. At each level, the most significant principal components are selected. We can see that the results from a compression perspective are good. The percentages reflecting the quality of column reconstructions given by the relative mean square errors are close to 100%. 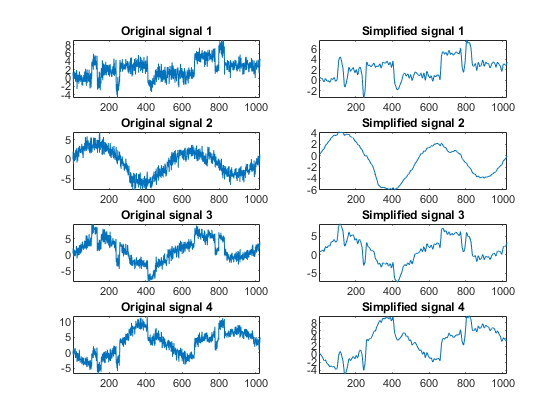 We can improve the results by suppressing noise, because the details at levels 1 to 3 are composed essentially of noise with small contributions from the signal. Removing the noise leads to a crude, but efficient, denoising effect. For d from 1 to 5, npc(d) is the number of retained noncentered principal components (PCs) for details at level d. npc(6) is the number of retained non-centered PCs for approximations at level 5, and npc (7) is the number of retained PCs for final PCA after wavelet reconstruction. As expected, the rule keeps two principal components, both for the PCA approximations and the final PCA, but one principal component is kept for details at each level. As we can see above, the results are improved. Aminghafari, M.; Cheze, N.; Poggi, J-M. (2006), "Multivariate denoising using wavelets and principal component analysis," Computational Statistics & Data Analysis, 50, pp. 2381-2398.